First things first—before we start ranting about the problems of Pokemon's TCG, let me say that I'm actually quite fond of the game. Heck, for months I've been counting down the best cards from each set and always enjoy doing so. That said, several obstacles in the rules obstruct gameplay. 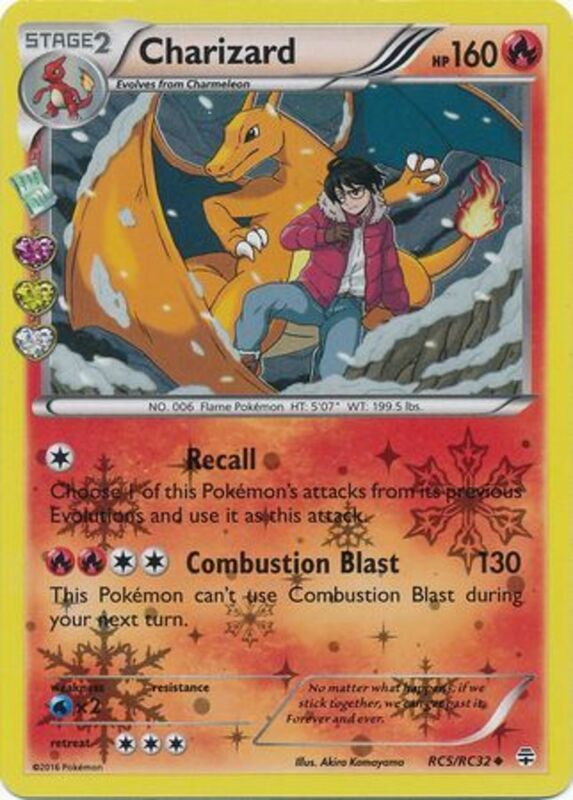 Sure, all card games have their issues, but of what I call the "Big Three" of TCGs (Pokemon, Yu-Gi-Oh, and Magic: The Gathering), Pokemon, in particular, amasses several hazards. Want to see what I mean? 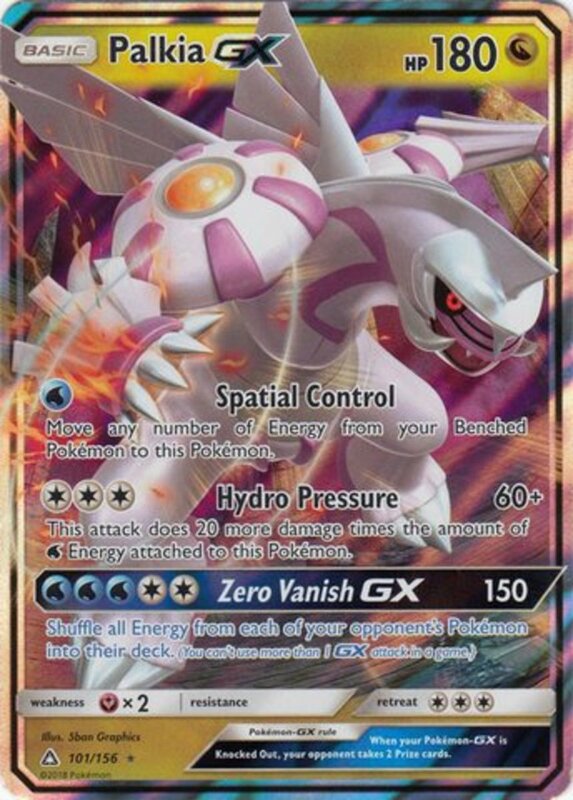 Don your complaining cap as we explore (nitpick) five problems with the Pokemon TCG! Admittedly, this problem won't be present in competitive settings, but let's not jump the gun. 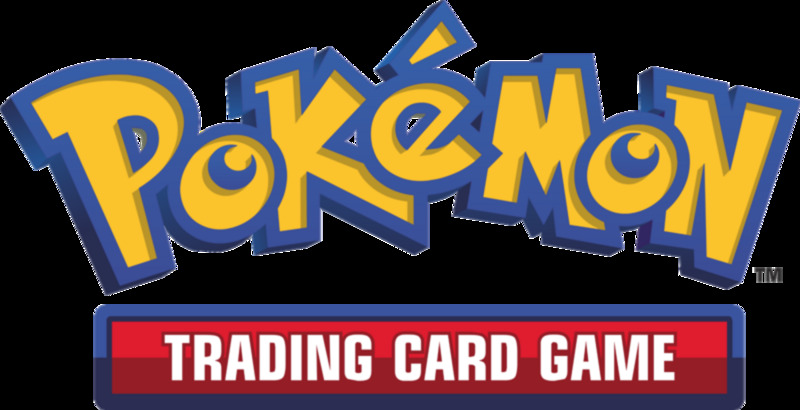 Odds are you've interacted with Pokemon's TCG at some point, whether it's receiving the cards as a kid or buying them for your own. Now, how many of you actually know the rules to the game? To be clear, I'm not insulting you if you don't—I certainly didn't for many years—I'm just pointing out that most consumers never even play it. As kids, we prefer collecting, why bother learning a semi-complex card game when we can just engage in the more-famous electronic titles? Thus, few of our children have actually explored the intricacies of the TCG, and having to hunt for competent players distracts from the enjoyment of the game. 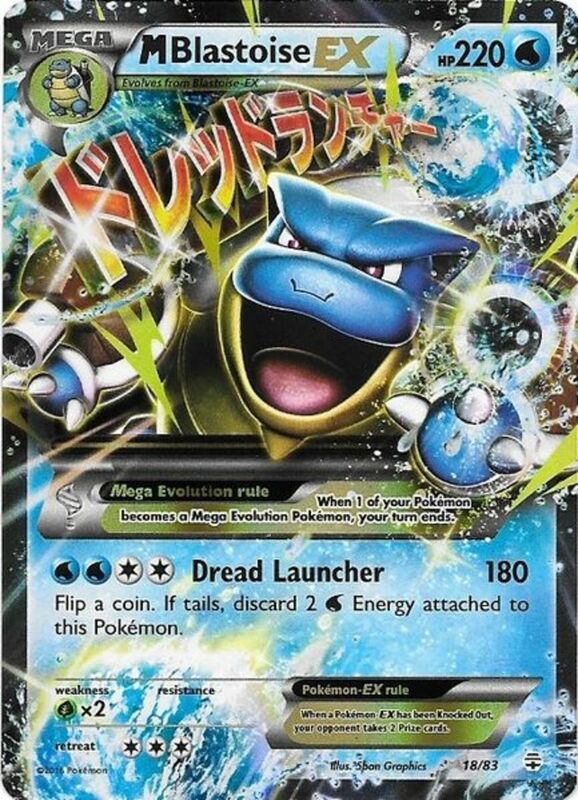 Here's another test: Is the Mega Blastoise card above an official trading card? If so, is it legal for tournament use? If you're unsure, don't feel bad, but understand how challenging it is to gauge whether you're playing against actual Nintendo products; this Blastoise is both real and legal. 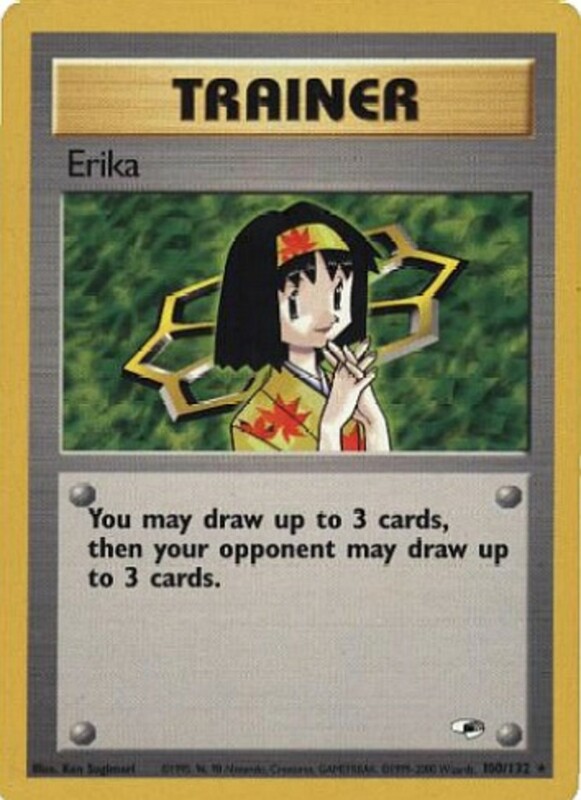 Do you know how to play the Pokemon TCG? We have over 70 expansions; how many are legal? As of this writing, you have to travel down the list to the sixty-third set before the cards become accessible for the Standard format. But it hardly matters anyway—very few of those aging cards could compete with modern ones. Now, Pokemon isn't the only card game that ups the power of its monsters over time (Pendulum summons in Yu-Gi-Oh, anyone? ), but at least Magic and YGO are designed in ways that let them provide new support for older themes, keeping many relevant. 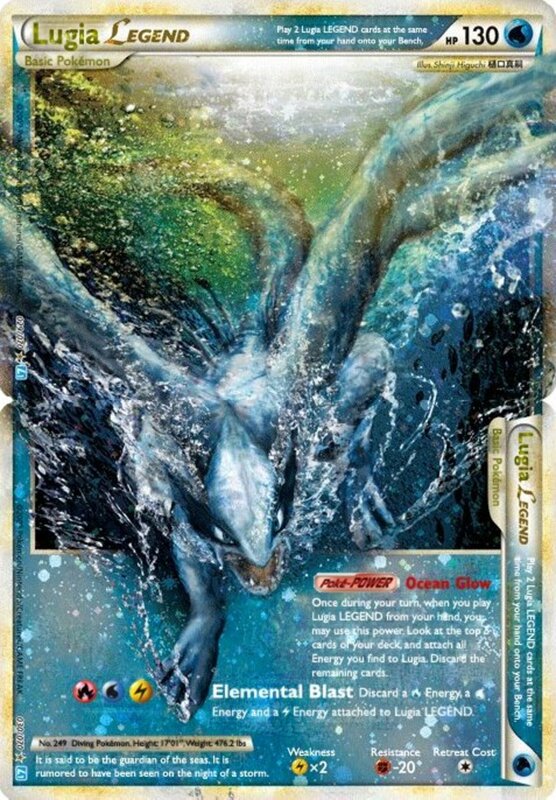 For instance, Blue-Eye White Dragon decks are still common and viable competitively in YGO. 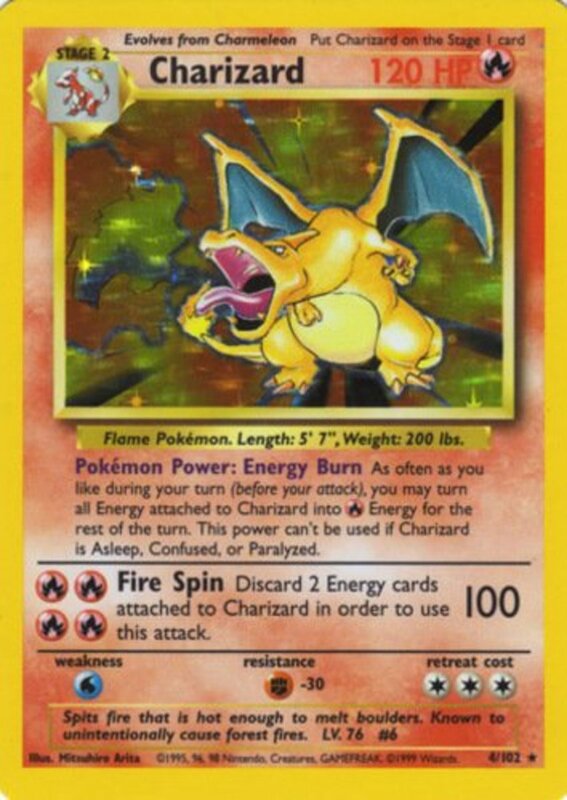 Just check out Base Set Charizard, the king of its day, who now can't hold a torch to Generation's Charizard, which wields more HP, stronger attacks, and fewer Energy-discarding requirements. Any resource-building game must carefully regulate its rules to prevent the first player from gaining a massive advantage. For example, in Magic, players utilize land cards to fuel their spells, and while the first player gets to play their land first, they don't draw on the first turn. This mitigates the issue by giving the second player card advantage. Pokemon's system is far less elegant. Check out the above table and notice how the game heavily skews towards the initial player. 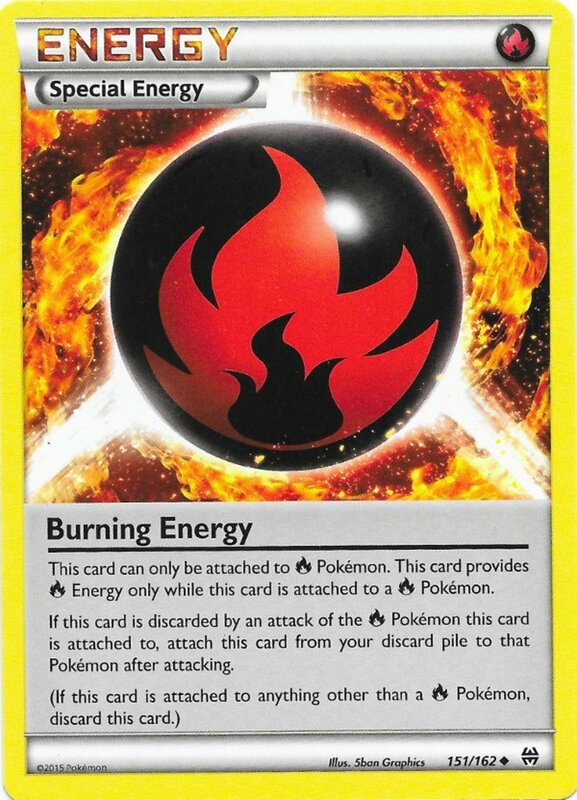 Ninety-nine percent of decks would rather miss out on a one-Energy attack (assuming the starting Pokemon even has one) than forfeit extra cards and Energy. One Solution: In Magic's vein, prevent the first player from drawing on their beginning turn. They can't attack and lose card advantage, but retain the upper hand with Energy attachment. Sadly, this idea is currently unofficial, but hopefully the game will take note. As previously mentioned, older expansions are outlawed and terrible, so go ahead and eliminate most of the cards ever made when constructing your deck. Admittedly, this makes it faster to browse modern options, but limits customization—not exactly what I'd dub an equal trade. Even worse, to stand a fighting chance, your deck can really only contain a few elements. Unlike the video games, where you'll want to amass a team of varied Pokemon to cover each other's weaknesses, Energy requirements for attacks restrict you to maybe two types (three if you count Normal Pokemon, who accept any Energy). Any more and you're bound to run into situations where you have enough Energy numerically, but they aren't the needed element. 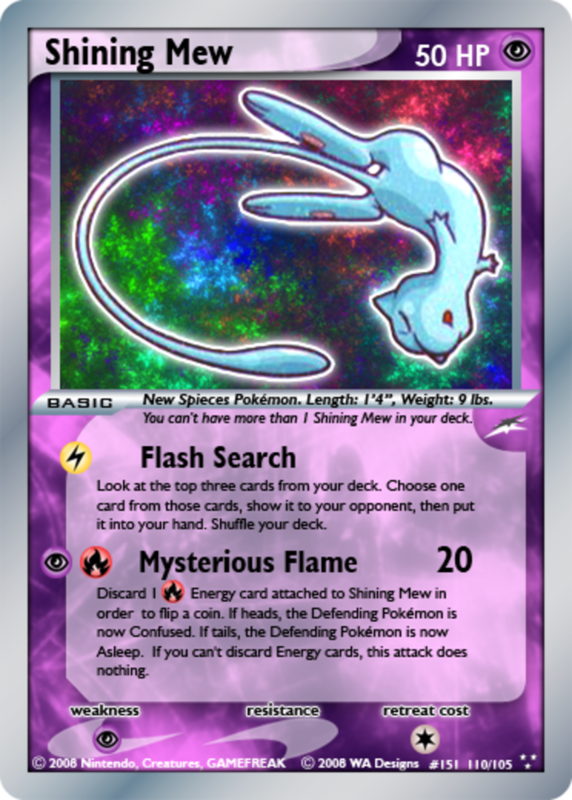 Check out the Mew card above, one of the "Shining" Pokemon notorious for being unplayable due to needing three separate types of Energy to unlock their attacks. Admittedly, card games by definition include a luck factor; sometimes you just don't draw well. However, most contain enough strategic elements that well-built decks can often overcome inferior luck. Remember, because decks are limited to one or two types, if your opponent happens to be playing one that your element is generally weak to, you're probably going to lose. Even if you play superbly, you'll simply struggle to overcome taking double damage, especially if your foe's team also resists your element. And heaven help you if you're facing and type disadvantage and playing second. Even worse, the majority of attacks involve coin flips. I understand that Pokemon video games also involve luck, like with the accuracy of moves, but not nearly to this extent. Here, many attacks are all-or-nothing. 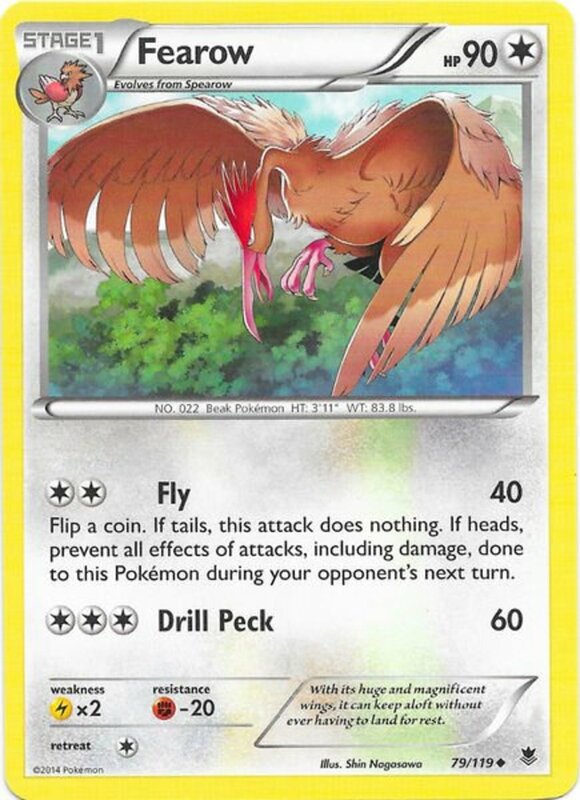 For example, examine Fearow from the Phantom Forces set. Thankfully, it has Drill Peck, a luck-free technique, but Fly changes drastically based on a coin flip. It either nails a solid 40 damage and makes Fearow invincible the next turn, or does absolutely nothing. All based on whether you land Heads. This isn't an abnormality, either; attacks like these run rampant throughout the TCG. Which trading card game do you favor? Do these factors mean the Pokemon TCG is bad? Not at all! In fact, it's much easier to learn than Magic or Yu-Gi-Oh, and who can deny the awesome feeling of collecting your favorite monsters in card form? In other words, despite limitations, Pokemon's TCG still contains plenty of strategy and induces loads of fun. Just remember that the best-constructed deck can and will lose when Abe Lincoln and George Washington aren't agreeing with you. Basically, if you're looking for something as complex and thought-dependent as chess, you'll get frustrated when luck ruins your matches. But if you're seeking a blend of strategy and accessibility, Pokemon has the other two TCGs beat. 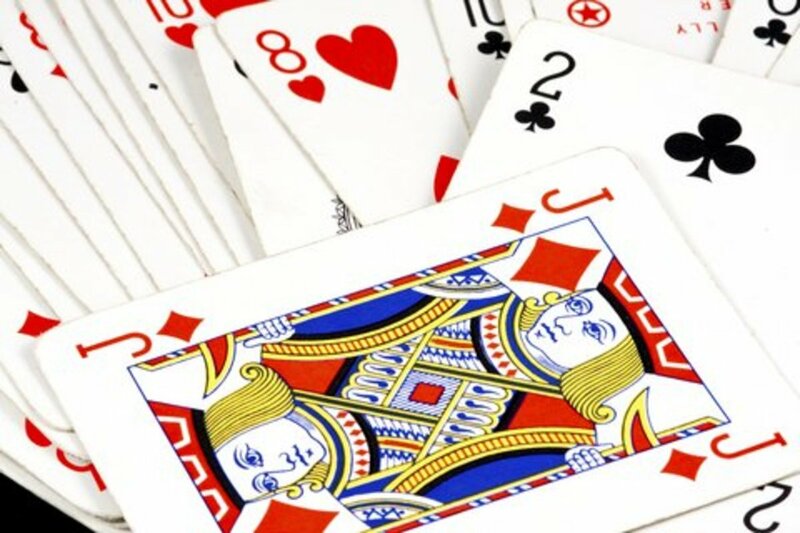 Happy playing, and I hope to see you at my card countdowns! I stopped playing for 20 years because of too much copy of decks and cheaters. Just not a fun game anymore. That's a great point, and I appreciate your insight. Still, I'd counter that the games don't rely on luck as heavily (most attacks have strong accuracy and low chances of added effects), where the TCG (especially earlier sets) often had a move's entire success depend on a 50-50 coin flip. It's also easier to diversify your team in the games, ensuring you have counters to any given type, but in the TCG, most decks only run one or two elements, meaning they have few checks against their elemental weaknesses and can lose from an ill-fated matchup. The Pokemon games (Red, Blue, Yellow, etc.) were luck based too - video games have random number generators that drive the entire game. The card game should have the same amount of uncertainty - almost like the mons have a mind of their own, but are better controlled with trainer cards. I personally dislike the Ex/Gx era. You may be a newer player; Pokemon's TCG has (thankfully) begun moving away from the luck factor. For many years, the majority of cards had at least one coin flip-based attack, and while far less do nowadays, it's still a more prevalent mechanic than most other TCGs. I agree that, to an extent, it's possible to build around type disadvantages, but it can still be pretty frustrating to lose to your weakness simply due to double damage. Fortunately, things have gotten better; resistances only block 20 damage now compared to the 30 they used to negate. Remember, I'm a fan of this TCG, and I'm glad it had made positive strides in several directions. That said, there's still a ways to go, in my humble opinion. I disagree with a few points in Pokemon. If you are running the deck correctly, you can get through almost a third of your deck in a single turn (supporter cards, item cards, Pokemon abilities, etc). This greatly improves consistency versus a game such a Magic. You saying most attacks are coin toss based is also incorrect. None of the decks I've played with will have a coin toss in its attack, just so I will never had that kind of random chance. Third, type disadvantage is a big thing, but can be played around. The top decks often have to overcome this disadvantage in tournaments, and will still beat the decks that they are weak against. I find the constant coin tosses with attacks too luck based. I litterally lost games because I lost every single toss in the game. Pretty infuriating. Actually, Pokemon does a decent job with equalizing beginning hands since it forces each player to have at least one basic Pokemon in their opening hand; if they don't, they reveal their hand and reshuffle and draw until they do. Compare this to, say, Magic: The Gathering, where you can draw a full hand of spells but no lands to use them. You can mulligan, but the more times you need to, the less cards you draw and the weaker your opening hand becomes. Ideally, some of your supporter cards should help you search out Pokemon from your deck, so don't forget the utility cards that can get you the creatures you need. I have to agree, it's annoying to follow all of the rules when they change just about every year. Great article! Hmm.. there's definitely more elements to consider now, like Mega Evolutions, Pokemon Tools, and Supporter cards. So in that regard, the game has more options available to players. That said, it can be hard to jump back in because, as discussed, many old sets are banned and not helpful besides. 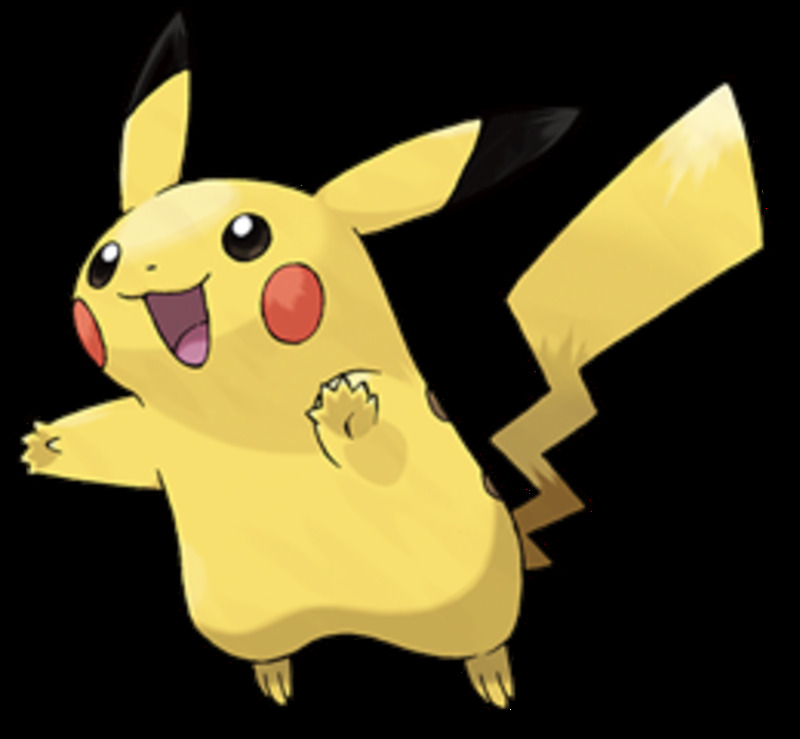 You can download (for free) the Pokemon Trading Card Online game and use that as a good test! haha i love the pokemon tcg but it really does depend on luck. nice read!